This scrumptious brown sugar pecan praline sauce is a very easy dessert sauce to prepare, and it is out of this world on ice cream, bread pudding, or cheesecake. The pecan praline sauce is made with brown sugar and butter, along with some evaporated milk and lots of chopped pecans. This is great with toasted pecans as well. See the tips for how to toast pecans. In a small saucepan over low heat, combine the brown sugar, evaporated milk, and butter. Cook and stir the sauce until it is smooth and syrupy, or about 5 minutes. If it seems lumpy at all, strain it through a mesh sieve. Stir in the vanilla extract and pecans. The sauce will thicken as it cools. 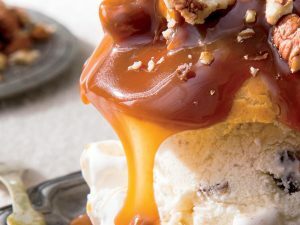 Serve praline sauce warm over ice cream, cheesecake, or bread pudding. Refrigerate any leftover pecan praline sauce and heat it in the microwave or on the stove top before using. How to toast pecans. Spread the pecans out in a dry frying pan or skillet. Place the pan over medium heat and cook, stirring and turning the pecans constantly, until they are lightly browned and aromatic. Remove to a plate to stop the cooking process. Alternatively, spread the pecans out on a baking sheet and bake in a preheated 350 F oven for about 5 minutes, checking and stirring frequently. Substitute dark brown sugar for the light brown sugar or use an unrefined brown sugar, such as muscovado, if desired.